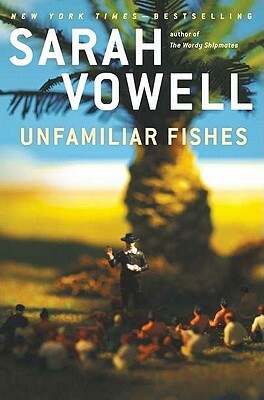 In her most recent book, Unfamiliar Fishes (on sale tomorrow), Sarah Vowell turns her witty attention to the annexation of Hawaii, where, as the back of the book claims, "Manifest Destiny got a sunburn." This back-of-the-book blurb, unlike so many others, sets the stage - and the tone - of Vowell's latest offering perfectly. I'd never have said so before, but the annexation of Hawaii was American Manifest Destiny at its best (or worst, depending on your point of view). And Vowell's account of this history is at once timely, poignant, and humorous. An interesting combination, thinks you? You think right. I write this with the news blasting updates on Operation Odyssey Dawn in the background. Despite the fact that the operation name sounds like a parody, this is no joke. And with newscasters repeating time and time again phrases on the importance of spreading democracy, and the inherent desire of all people to be free, and blah, blah, blah... well, let's just say that Vowell's seemingly obscure history of Hawaii suddenly snaps into quick focus. There are recurring themes, here. The infamous "they" were right again when they stated that history is doomed to repeat itself. But I couldn't have known this before diving in, of course. I picked this book up solely because Sarah Vowell wrote it. I've already written about my near-fanatacism for Sarah Vowell. Why else, really, would I have read a book about Hawaii's history? I'm an East Coast girl, born and bred. My interest in history is limited to early America, the Civil War, the Industrial Revolution, World War II, Ireland, Ancient Rome, Ancient Greece, and English monarchies. Fine. Maybe it's not so limited. But note that Hawaii does not make an appearance in this list. Nevertheless, Unfamiliar Fishes was right up my alley. Vowell's writing, as usual, is factual, detailed, and often laugh-out-loud hilarious. Her research is (to these uneducated eyes) near impeccable, and ridiculously thorough. As with her other subjects (patriotism, presidential assassinations, and Puritans), she meanders through history, at times wandering far from the subject at hand, but always managing to keep these diversions to task and shockingly relevant. Perhaps because of the very serious situation into which she is writing, I found this particular Vowell volume to be slightly less laugh-out-loud hysterical than her previous writings, though it is certainly peppered with a fair amount of Vowellensian humor. I particular liked the sentence that started, "Dewey decimated..." Touché, Sarah. I tip my hat to you on that one. If you've ever read Vowell, you already know what I'm talking about. And if you haven't, you're missing out. Big time. Feel free to start anywhere you like, but be sure your reading of her includes Unfamiliar Fishes, or you'll be missing out on an excellent dose of history, wit, and a host of information you never knew you didn't know. Note: Many thanks to Lydia Hirt of Riverhead Books for sending me a copy of this title for review.